Master key systems will typically work off of a basic pin tumbler lock. In a master key system, authorized personnel can be given a “Grand Master” key that can open every lock in the building. This grand master key replaces the needs for a large confusing key ring and makes it easier for property managers or building supers to make sure they can access any room they need. If you need help installing a master key system, or have a master key system that needs to be serviced, call Lock Dawg. We’re the number one seller, installer, and provider of service for master key systems in Northeast Georgia. Simply put, a master key system is a method of securing large complexes, such as an apartment complex or an office building, in such a way that access to multiple points, by multiple people, can be organized and controlled. Picture a Christmas tree. In master key systems, less powerful keys at the bottom are called “change keys”. 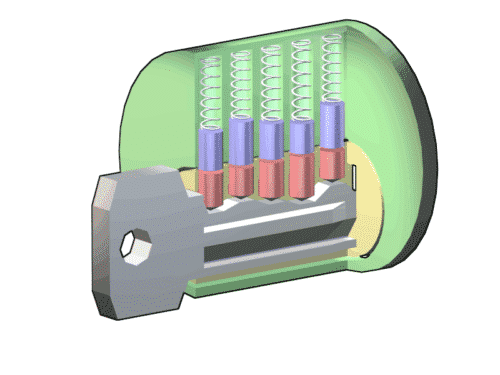 Each one operates only one lock or one group of locks. The key at the top is known as the “master key”. The simplest master key systems have two levels of keying and are considered the lowest level of master keying. Indeed, a master key system can be scaled to incorporate multiple “masters”. These are known as multi-level master key systems. Take an apartment complex for example. All of the tenants might need access to the main lobby entrance, the laundry room and, of course, their individual apartments. For convenience, the lobby and laundry room might share the same key and each apartment its own key (change keys). But what of the property manager, who may need access to all apartments as well as the lobby and laundry? This is where a master key system is both convenient but also secure. Rather than maintaining a key for each apartment, the property manager might be issued a “master” key allowing access to all apartment locks. When a new tenant moves in, there is no need to re-key every lock only the individual apartment. Lock Dawg locksmith technicians are insured and experts at securing both residential and commercial properties. In addition, we offer clients a mobile locksmith service, which is available from 8am-12am (midnight). Ready to have a multi-level master key system installed on your property? Call Lock Dawg. Our registered and certified locksmiths can consult with you and customize an access control plan that fits your needs.